Uk based Thermoform replace old inefficient evaporative cooling system with new EcoCooling system! For over 40 years Thermoform have designed, developed and manufactured bespoke vacuum formed plastic packaging for some of the country’s best known and most demanding companies. Their customers operate across a wide spectrum of industries including – confectionery and bakery, meat and savouries, toiletry and pharmaceutical, electronic and light engineering, homeware and DIY. All design, development and tool making at Thermoform are in-house at their specialist facility in Ashbourne, Derbyshire. Production of the final product is carried out at their adjacent manufacturing site where a bank of fully automatic machines form, cut and stack in-line a wide range of plastics including RPET which has now become the default choice for most customers because of the high recycled content. 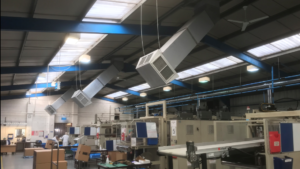 Thermoform Limited were looking to replace their old ineffective evaporative cooling system, they went to EcoCooling and installer Celsius to provide a more effective solution that suited their needs. Natural fresh air cooling was required for the shop floor as well as an economic and environmentally friendly cooling option. The recommended solution was to install 3 no. EcoCooling wall mounted evaporative cooling units. EcoCoolers contain an inbuilt fan and evaporative cooling pads. The evaporative coolers are designed to be externally mounted and should be used as part of a mechanical ventilation system with a paired extract fan. The standard configuration is down flow, where the air is supplied from the base of the cooler into the area that requires cooling. Each of these units provides 35% more fresh cool air than the old units, resulting in a far more efficient and effective cooling solution for the warm shop floor area. In addition to the installation of the EcoCooling units, the old roof mounted Breezair system was removed and roof holes were fully weathered. Denis Fitzgerald, General Site Manager of Thermoform stated he was thrilled with how well the installation went and was looking forward to utilising a more efficient and economic system. At EcoCooling it is our goal to save the U.K. 1% of its total power bill.